The country that we know today as Nigeria first fell within the sphere of influence of the British Empire in the late Nineteenth Century. 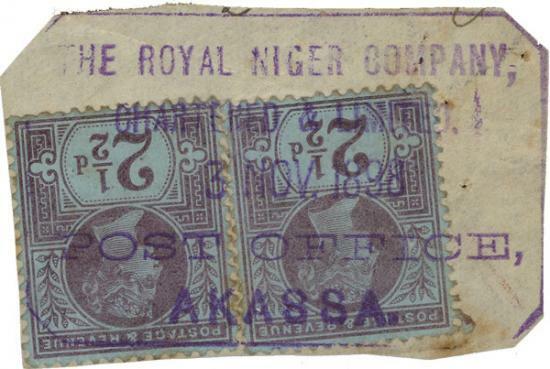 The global suppression of the slave trade was a key priority for successive Victorian governments, but it soon became difficult to disentangle such noble political imperatives from more straightforward commercial ones: in 1886, the Royal Niger Company was established, under Sir George Taubman Goldie, with a mandate to ship palm oil, cotton, timber, ivory and beeswax back to the "mother country." 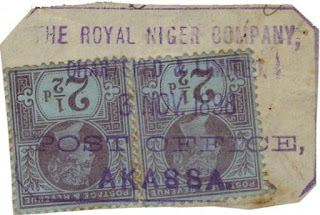 British stamps used at Akassa, Nigeria. HMSO (image is in the Public Domain). 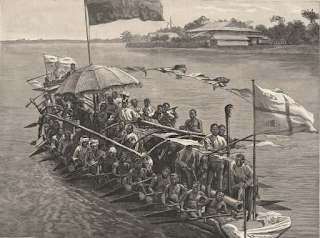 The war canoe of King Koko of the Nembe, an antagonist of the Royal Niger Company in the 1890s. Daily Graphic (image is in the Public Domain). 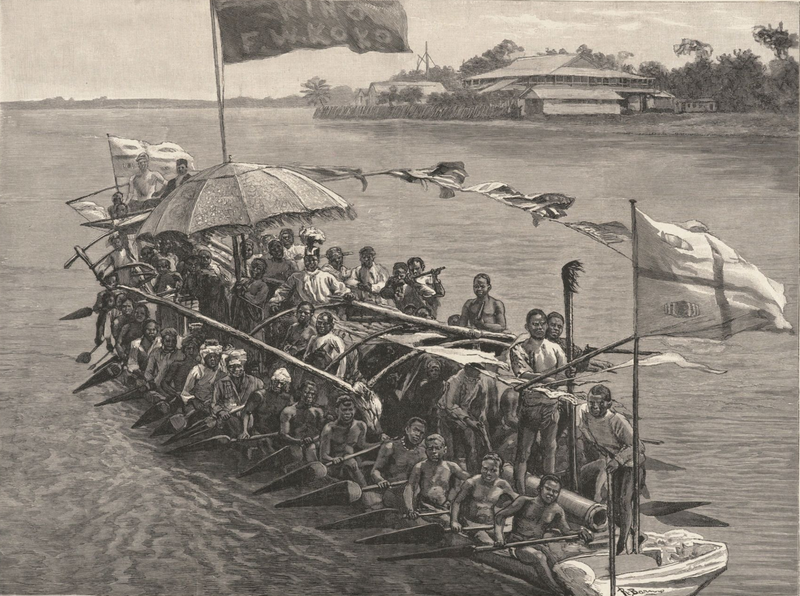 The British administered its Nigerian territories (a Northern and a Southern Province, together with the "Lagos Colony") via a system of "indirect rule," with a relatively small number of English Residents" and District Officers, supported by a native elite of regional and village chiefs (Emirs in the Northern Province), who were granted educational and financial privileges in return for their loyalty. 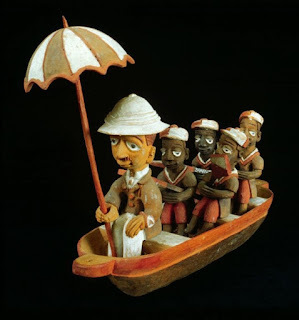 Yoruba sculpture, satirising "indirect rule." Image: Tropenmuseum (licensed under CCA). In contrast to many other colonies, including Kenya, Nigeria did not undergo a long and violent struggle for independence. Realising that the World had changed since the end of the Second World War, and that Nigeria, specifically, was unlikely to be susceptible to the influence of Soviet or Chinese Communism, the British authorities negotiated what was intended to be a smooth transition to independence and democracy. The only problem was that "Nigeria," as a geographical or political concept, meant little to most of the people who lived there. Loyalties operated on a far more local basis, and, when elections were held, most people voted for members of the same tribal elites that had held power under the British. 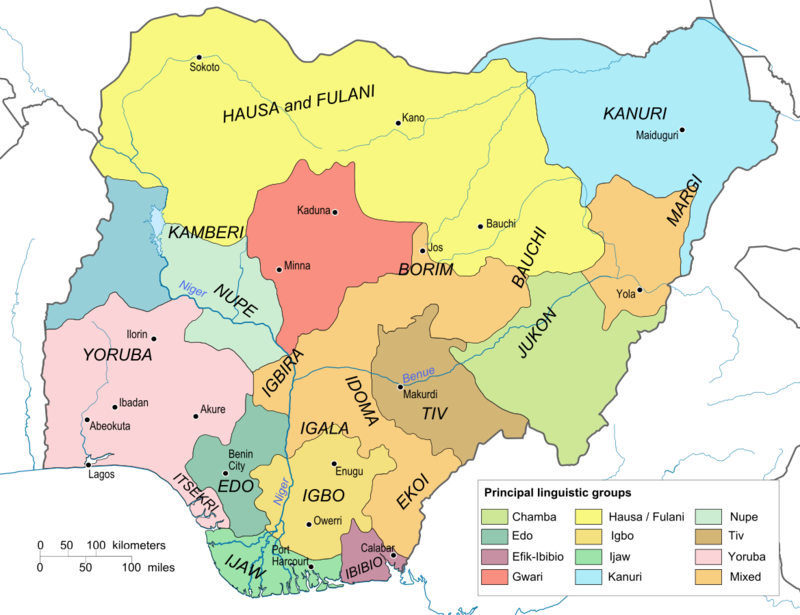 Linguistic map of Nigeria. Image: Hel-Hama (licensed under CCA). A federal republic was proclaimed in 1963, but, in the elections that followed, different parties emerged to represent the predominantly Muslim Hausa and Fulani people of the north; the Yoruba people of the south-west; and the Igbo people of the south-east. 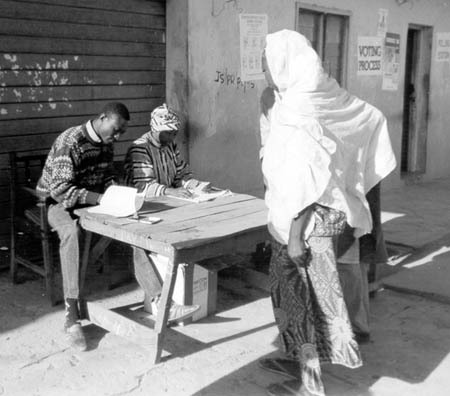 Smaller parties were pushed aside, amid widespread complaints of corruption and intimidation, and those who had been elected by communities with very different priorities struggled to find common cause with one another. The Nigerian military staged a coup in 1966, which was followed by a bloody civil war. A second republic, proclaimed in 1979, lasted only for four years; a third lasted for just a few months in 1993; and the fourth, declared in 1998, following the death of the military leader, General Sani Abacha, continues to this day, but has faced significant challenges throughout its nineteen years of existence. 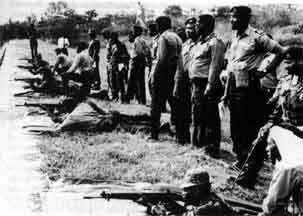 The Nigerian Civil War (image is in the Public Domain). Election in Nigeria, US Agency for International Development (image is in the Public Domain). 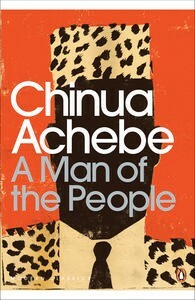 Chinua Achebe's novel, A Man of the People, published just weeks before the 1966 coup, is set in a fictional rural district of an unnamed African country, but it feels very like the Igboland in which its author grew up. An educated, idealistic and naive young man, Odili Samalu, is teaching in a village school, when it receives a visit from the Minister of Culture, his own former teacher, Chief the Honourable M.A. Nanga MP. Nanga takes an interest in Odili, and invites him to his home. A bright future n public service seems in store for Odili, but he soon learns the true price of patronage, and when, with a group of friends, he decides to challenge Nanga for his parliamentary seat, he not only discovers the corrupt and brutal underside of the politics of his country, but is also forced to confront his own motivations, and to ask whether he, himself, has not been compromised by the system that he set out to change. "No one can deny that Chief the Honourable M A Nanga, MP, was the most approachable politician in the country. Whether you asked in the city or in his home village, Anata, they would tell you he was a man of the people. I have to admit this from the outset or else the story I'm going to tell will make no sense." "My father was a District Interpreter. In those days when no one understood as much as 'come' in the white man's language, the District Officer was like the Supreme Deity, and the interpreter the principal minor god who carried prayers and sacrifice to him. Every sensible supplicant knew that the lesser god must first be wooed and put in a sweet frame of mind before he could undertake to intercede with the Owner of the Sky. So interpreters in those days were powerful, very rich, widely known and hated. 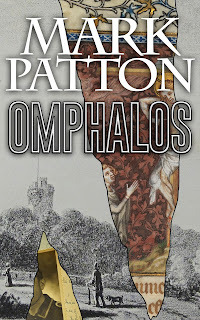 Wherever the DO's power was felt - and that meant everywhere - the Interpreter's name was held in fear and trembling." "The appearance of comparative peace which Max's house presented to me that morning proved quite deceptive. Or perhaps some of Chief Nanga's 'queen bee' characteristics had rubbed off on me and transformed me into an independent little nucleus of activity which I had trailed with me into this new place. That first night I not only heard of a new political party about to be born but got myself enrolled as a foundation member. Max and some of his friends having watched with deepening disillusion the use to which our hard-won freedom was being put by corrupt, mediocre politicians had decided to come together and launch the Common People's Convention." 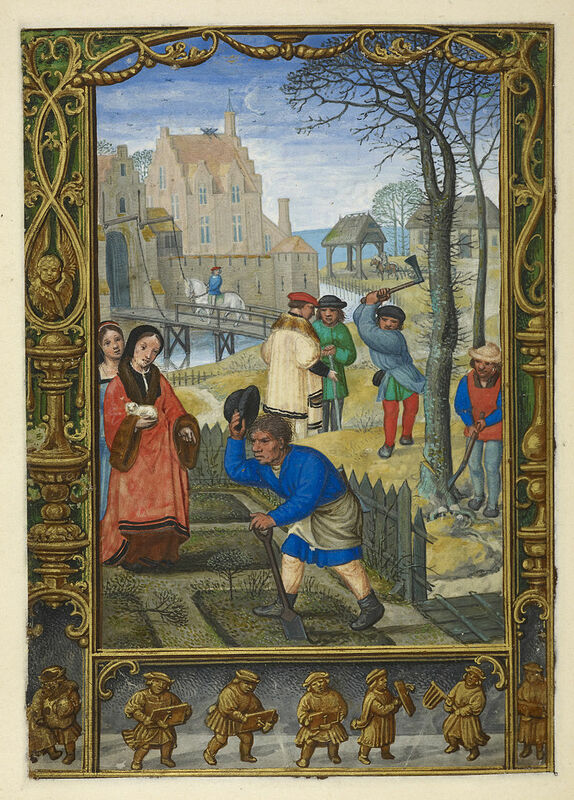 For more than a thousand years, through the Middle Ages and the Early Modern era, the lives of most people in Europe west of the Aegean resonated to the rhythms, chants, melodies, and prayers of the Roman Catholic Church. In cathedrals, abbeys, and parish churches, from the Arctic Circle to Malta, and from Poland to Portugal, bells, incense, and the words of the Latin Mass, coalesced to provide a fixed point in lives all too often disrupted by the uncertainties of plague, famine, and war. 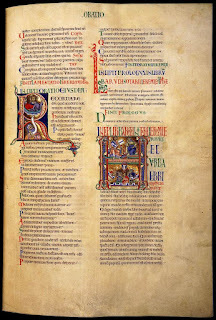 Although convulsed by the Protestant Reformation of the Sixteenth and Seventeenth Centuries; by the anti-clericalism of the French Revolution, and parallel movements elsewhere in the world; and by the advance of scientific rationalism and secularism in the Nineteenth and Twentieth Centuries; the Roman Catholic Church remains, to this day, one of the largest organisations in the World, with an estimated 1.27 billion members. 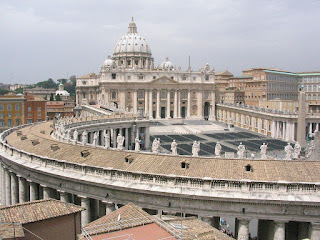 Saint Peters Basilica, Rome. Photo: Alberto Luccaroni (licensed under GNU). In order to maintain its position, however, the Church has had to adapt. 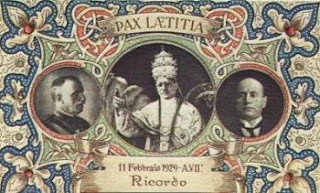 Until the unification of Italy in 1870, the Pope was a secular ruler, as well as a spiritual leader, controlling lands centered on the city of Rome itself. 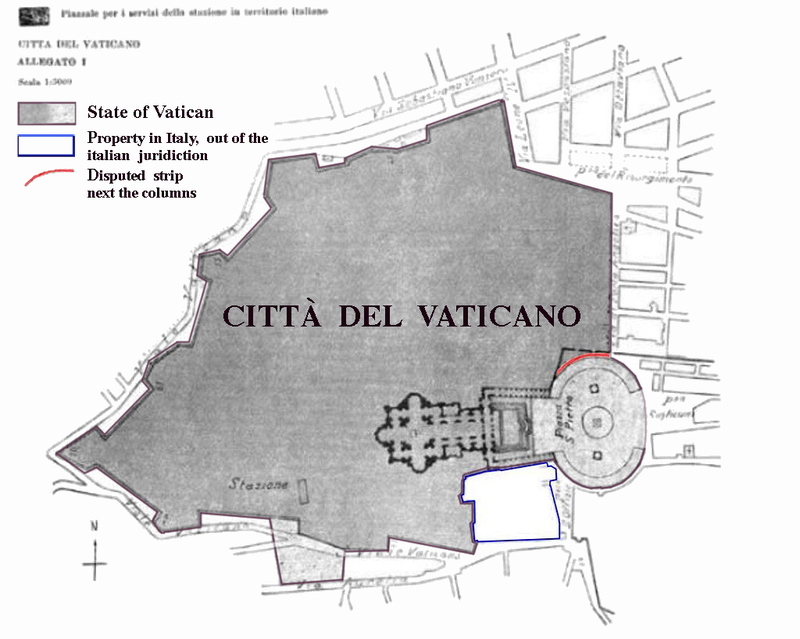 He retains the title of Pontifex Maximus, once held by Julius Caesar, but his territorial remit is now confined to the Vatican City itself, the result of a treaty between the Church and the Italian dictator, Benito Mussolini, which could hardly have failed to compromise the integrity of the Holy See. In the dark days of the Second World War, some clergy played a heroic role, sheltering Jews and other refugees from the Nazi and Fascist regimes; others collaborated enthusiastically; whilst many more walked a precarious tightrope between collaboration and resistance. Souvenir of the Lateran Treaty of 1929 (pictured are King Victor Emmanuel III, Pope Pius XI, and Benito Mussolini). 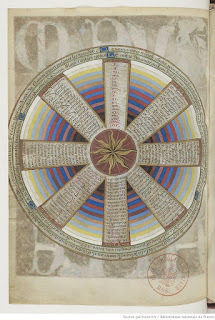 Image is in the Public Domain). 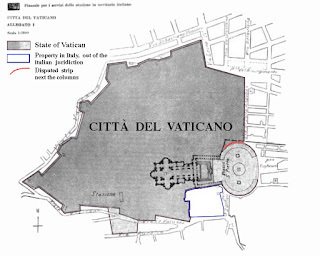 The territory of the Vatican City, as defined under the treaty (image is in the Public Domain). 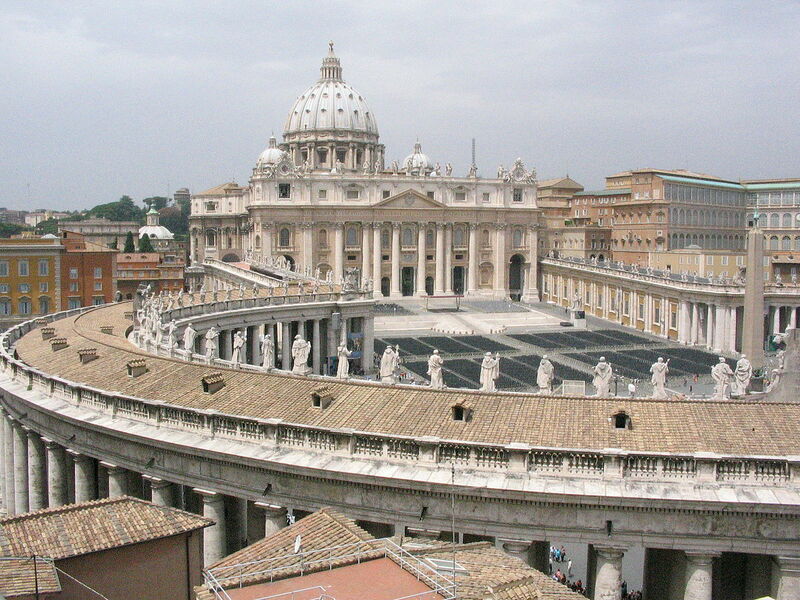 By the 1960s, with the physical and political reconstruction of Europe well underway, the Church was ready for reform. Pope John XXIII (reigned 1958-1963) surprised the Catholic world by summoning the Second Vatican Council, which would replace the Latin Mass with services in the languages of ordinary people; and sweep away many of the material trappings of Medieval ritual; whilst stopping short of the reforms that some of the most liberal commentators might have wished to see (married clergy, reproductive freedoms for the laity, an enhanced role for women within the Church). 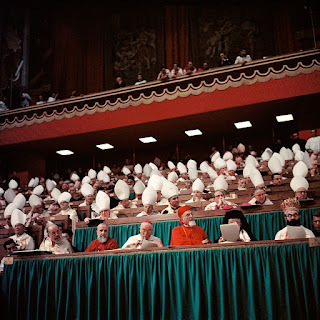 It continues to influence the shape of Catholic policy today: those who played prominent roles in the Council included the future Popes Paul VI, John-Paul I, John Paul II, and Benedict XVI. 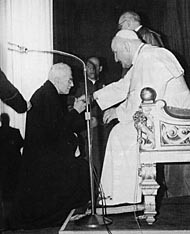 Pope John XXIII receiving Father James Alberione, an Italian priest credited as a pioneer of the Church's use of mass-media. Photo: www.paulus.org (reproduced with permission). 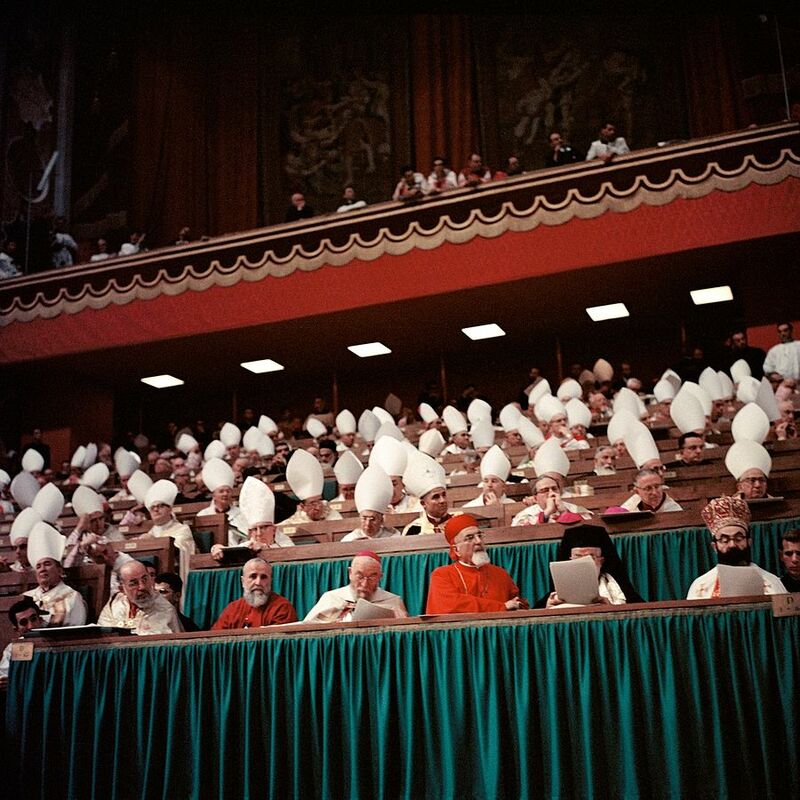 The Second Vatican Council. Photo: Lothar Wolleh (Licensed under CCA). 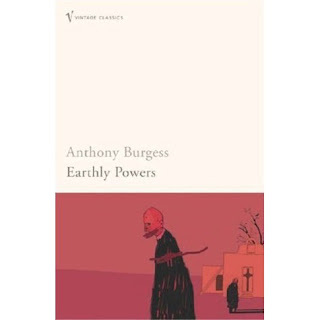 Anthony Burgess's novel, Earthly Powers, spans the first eight decades of the Twentieth Century, including both world wars, and the years following the second. Its unreliable narrator is Kenneth Toomey, a revered English man of letters, thought by many to have been styled on W. Somerset Maugham. Toomey is homosexual, one of the first generation of gay men to have lived more or less openly as such, without suffering the active persecution visited upon predecessors such as Oscar Wilde. Toomey's sister marries an Italian-American musician, Domenico Campanati, whose brother, Carlo, is an ambitious and reforming churchman, destined to ascend the Throne of Saint Peter as Pope Gregory XVII (he is not exactly a cypher for John XXIII, but there are clear parallels, including the broad timing of his reign). In the background however, is the darker figure of an American evangelist, Godfrey ("call me God, it's just an abbreviation, after all") Manning, with surprising links to the reforming Pope. 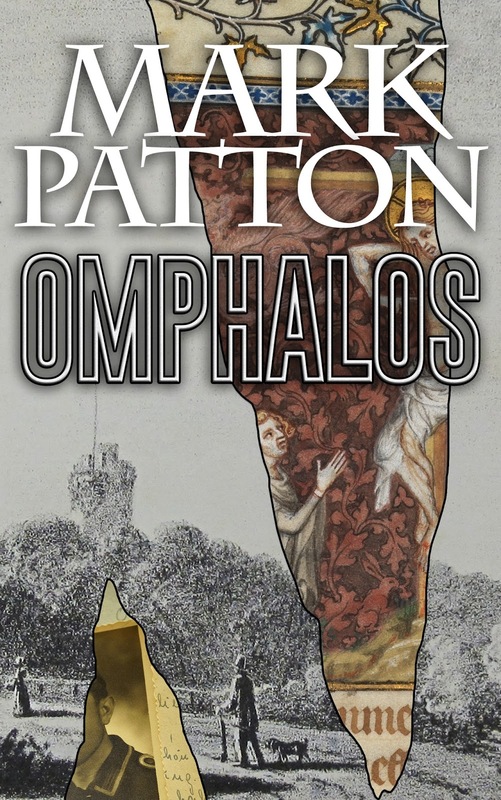 The novel is a half-serious, half-comic, meditation on power, secular and sacred, set against the background of the world-changing events and vibrant literary personalities (Hemingway, Joyce) of the Twentieth Century. "It was the afternoon of my eighty-first birthday, and I was in bed with my catamite when Ali announced that the archbishop had come to see me. 'Very good, Ali,' I quavered in Spanish through the closed door of the master bedroom. 'Take him into the bar. Give him a drink ... Give his chaplain a drink also.'" "Don Carlo's telegram had said he was coming for five days, but in fact he stayed well over a week. He had been gaining a reputation, I gathered, in the field of exorcism, and there was a tough job of exorcism to perform just outside of Nice. 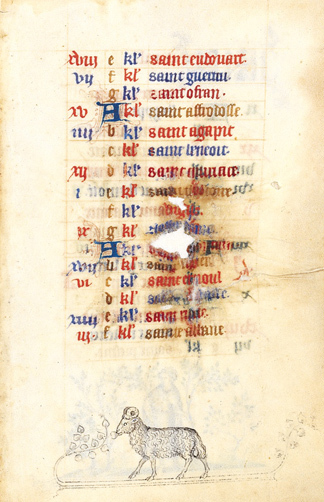 The Bishop of Nice had requested his services ... Don Carlo was said by His Grace to be the best man in Europe at fighting the devil, and this was meant very literally. 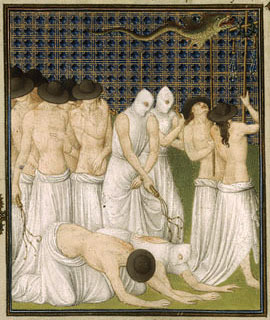 The devil was no metaphor to some of these churchmen but a palpable entity, or rather a well-structured army of entities (hence the name Legion, as in British Legion), with the Son of Morning as generalissimo in charge of Belial and Beelzebub and Mephistophilis, as well as a large number of NCOs and privates eager to fight the bad fight and gain promotion. 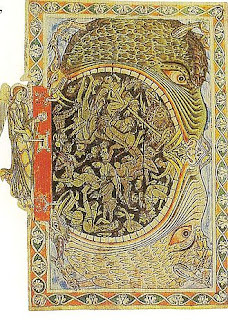 A lot of nonsense I thought at the time, but Don Carlo was ready to march in with the Rituale Romanum and, so to speak, knock hell out of these minor devils that had camped in the bodies of the innocent." A visitor to London, walking along the south bank of the River Thames, from London Bridge towards Westminster Bridge, having explored the precincts of St Mary Overie (now Southwark Cathedral), emerges from Montague Close into what was once the private wharf of that priory, in which is now moored a replica of the Golden Hinde, the ship once commanded by Sir Francis Drake. Beyond the wharf is Clink Street, continuing west, on entering which the visitor is confronted by the impressive remains of a Medieval building, the former palace of the Bishops of Winchester. 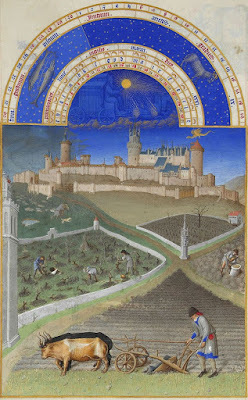 On both sides of the river, the roads leading west from the commercial hub of the City were, in the Middle Ages, lined with grand houses, including the London palaces of provincial bishops, who frequently had business at the Royal Court, and in Parliament. Most were close to the river, since it was much easier to provision a great house from the water than to do so from the land. Winchester Palace is unique only in the extent to which it has survived. The great hall of Winchester Palace. Photo: Mike Peel (www.mikepeel.net, licensed under CCA: CC-BY-SA-4.0). 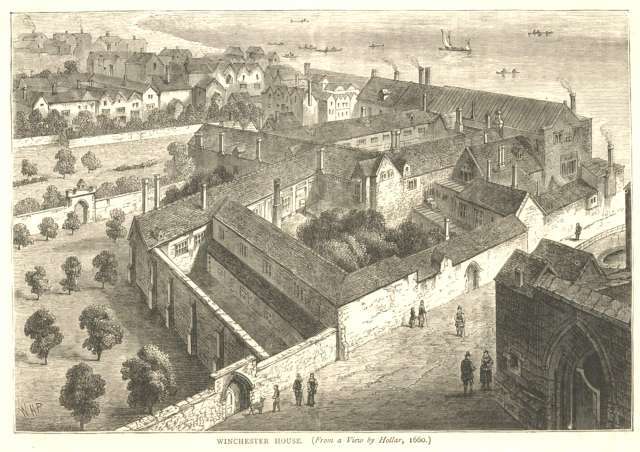 Winchester Place in c 1660, by Wenceslas Hollar (image is in the Public Domain). 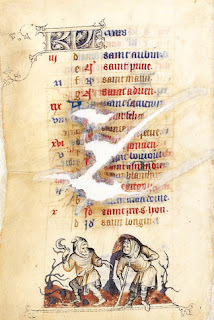 The great lords of the Church in Medieval England were often the younger sons of leading aristocrats, sometimes with close connections even to the Royal family. The bishop who built Winchester Palace was Henry of Blois, the younger brother of King Stephen, and a grandson of William the Conqueror. 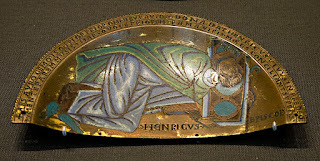 Henry of Blois, commemorative plaque, British Museum. Photo: Ealdgyth (licensed under CCA). Henry of Blois, British Library, Cottom MS Nero DVII, f87v (image is in the Public Domain). 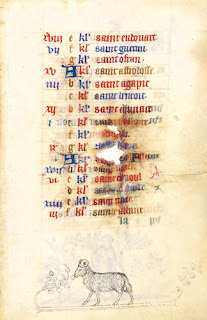 Henry had been educated at the great Benedictine monastery of Cluny, in Burgundy, a student of its abbot, the Venerable Peter, one of the leading theologians of his day, and the man who commissioned the first translation of the Qu'ran into Latin. 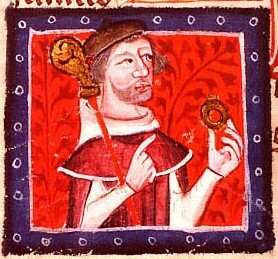 For all his learning, however, Henry was unable to resist the lure of gaudy politics: during the civil war, or "Anarchy" of the Twelfth Century, he changed sides twice: supporting, first, his brother, Stephen; then the Empress Matilda; then his brother again; determined, it seems, to end up on the winning side. This, however, was impossible. There was no winning side: the war ended in stalemate, with Stephen retaining the crown during his lifetime; but to be succeeded, not by his own children, but by Matilda's son, the future Henry II, during whose reign the Bishop of Winchester's influence declined. 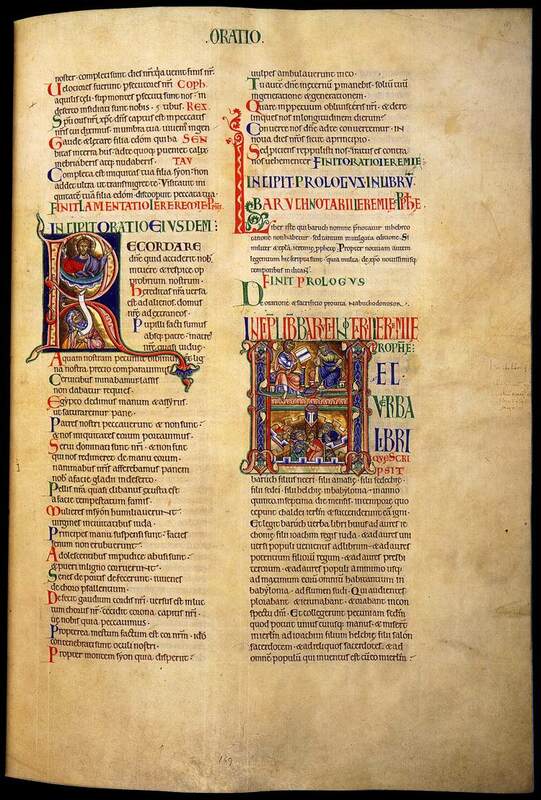 The Winchester Bible, commissioned by Henry of Blois, Winchester Cathedral (image is in the Public Domain). 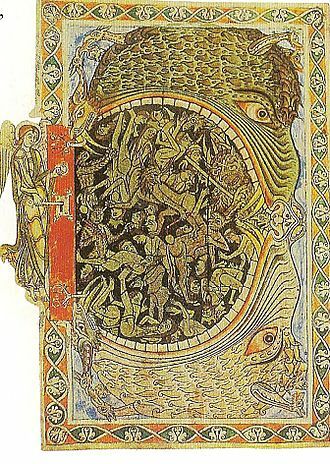 Depiction of Hell, from the Winchester Psalter, commissioned by Henry of Blois, British Library (image is in the Public Domain). 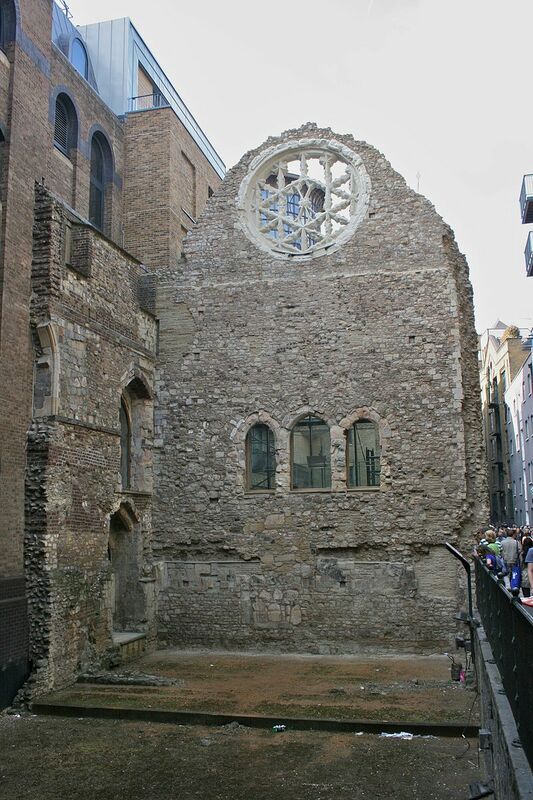 It was a later Bishop of Winchester, William of Wykeham, in the Fourteenth Century, who enlarged the great hall of the palace, and added the rose window that we see today. William also served as Chancellor of England under Edward III; founded New College, Oxford, and Winchester College; and supervised major building works at Windsor, Dover, and Leeds Castles. In 1424, the great hall was the venue for the wedding banquet of King James I of Scotland, and the niece of the then Bishop of Winchester, Joan Beaufort. 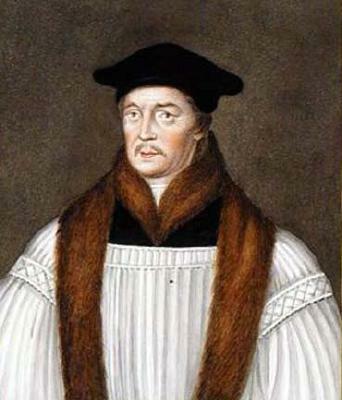 During the reign of Henry VIII, Stephen Gardiner held the office of Bishop of Winchester. 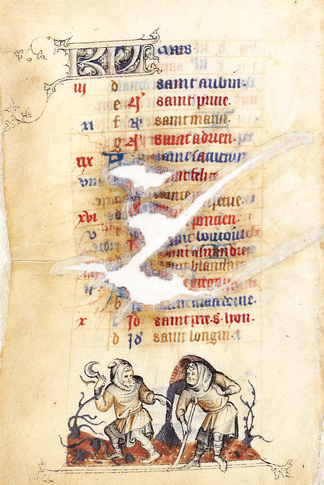 Like Henry of Blois, he preferred to remain on the winning side in political conflicts. An instinctive conservative, he had no enthusiasm for the Reformation, and disliked Thomas Cromwell, but he managed to remain in favour throughout Henry's reign. He could not do so under Henry's heir, the much more ardent Protestant, Edward VI, who had him imprisoned in the Tower of London. Stephen Gardiner (image is in the Public Domain). When the Catholic Mary I took the throne, however, she released Stephen, and it was he who crowned her in Westminster Abbey. 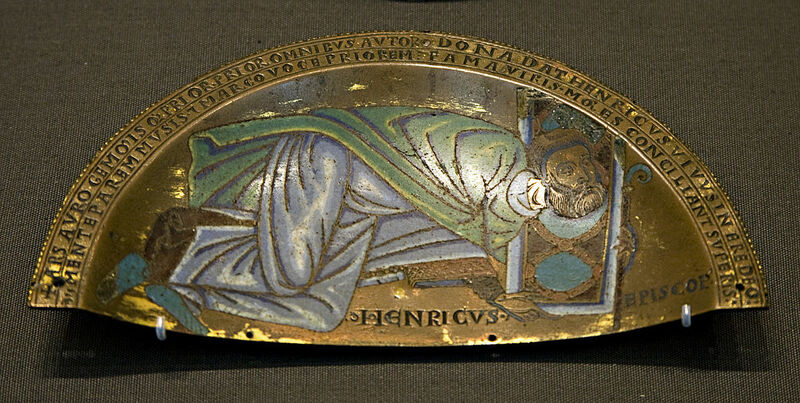 Unlike many of the churchmen of his day, but like his predecessor, Henry of Blois, he did manage to die peacefully in his bed, in comfortable old age.